Guerlain has launched Musc Noble, a new limited distribution unisex fragrance. Musc Noble joins the Les Absolus d’Orient series, and follows 2017's Oud Essentiel. Musc Noble is a floral woody musk, and was developed by Guerlain house perfume Thierry Wasser. The notes include saffron, pink pepper, geranium, rose, cedar, cistus, white amber and musk. 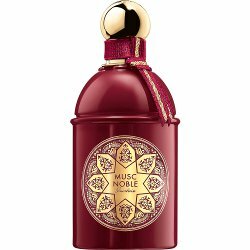 Guerlain Musc Noble is available in 125 ml Eau de Parfum, €155. This doesn’t sound like my sort of thing, but what gorgeous packaging! Yes, that bottle is really nice in that color. May I ask what is cistus? Another name for labdanum (cistus labdanum in Latin I think). The smell reminded me of something I couldn’t pinpoint, until someone mentioned plasticine. And yes, it’s like an unsweetened amber with a dash of plasticine! I mean the raw material cistus/labdanum. The Musc Noble is beyond my stratosphere. Thank you des esseintes, I was slow to get back here and see this question! And yes, cistus is generally one component of an amber accord. Overall the packaging for the Les Absolus d’Orient series has been really nice. The notes sound nice although cistus can be hit or miss for me. I haven’t liked any that I’ve tried in this line but probably won’t have the opportunity to test it anyway. The bottle is really nice.